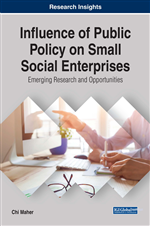 This chapter provides important perspectives from key informants about their experiences of the impact of public policy on small social enterprises. Semi-structured interviews were conducted with the 10 Chief Executive Officers (CEOs), 8 HR managers, and 46 operational managers working in small third sector social enterprises in four UK regions to ascertain how government policy framework poses challenges and/or encourages small third sector social enterprises growth and success. There is clear evidence that changes in public policy have had some challenging effect on services development and in several regions, with core services, training and employment support and preventative services are showing a net deterioration. Small third sector social enterprises have a long history of providing local and regional services due to their close engagement with grassroots communities (Kendall, 2003; Harris, 2010). They provide localised services while contributing to local, regional and national policy objectives. They help communities to take control of the social, economic and environmental development of their localities. These organisations can also bring significant long-lasting and sustainable positive changes at a community level, supporting the life of local people (Lyon & Sepulveda, 2009; Maher, 2015a). They are often valued by both the state and service recipients because of the distinctive approaches and values they bring to the provision of public services. However, the increasingly competitive environment in which small social enterprises are working, brought about by changes in public policy, particularly competitive tendering processes, has brought success for a few small social enterprises who gained new funding that enabled their organisations to expand and develop new services; but for many small third sector social enterprises this has been very challenging (Maher, 2015a). The UK government endorses the view that social enterprises are a useful model for closing the productivity gap with other nations and has been creating various strategies and policies for this purpose. This was integrated in the public policy agenda starting with New Labour (1997–2010). In May 2010, the coalition government pledged that it would support the third sector (including social enterprises) in having greater involvement in the running of public services and in promoting and building the ‘Big Society’ (Alcock, 2010; Mohan, 2011). The ‘frontloading’ of spending reductions onto local authorities at the beginning of 2010/11 has meant that organisations that were more reliant on local government contracts saw bigger losses of income (NVCO, 2016). Many small social enterprises themselves have faced crippling cuts, with 50 per cent of local authorities admitting to making disproportionate cuts to third-sector organisations’ funding in their area (Lupton & Fitzgerald, 2015). There is huge potential for small local social enterprises to deliver more effective public services on behalf of the state, making use of their close links to communities and their understanding of the needs and circumstances of their constituents. However, the government’s reduction in public-sector funding (2010–2015) has resulted in the sector losing millions of pounds each year from government funding (Lyon & Sepulveda, 2012; NVCO, 2016). The sector has seen a reduction in its income from government although among very large third-sector organisations the opposite appears to have occurred. Between 2008/09 and 2012/13, central and local government income decreased for third-sector organisations except for large organisations (those with incomes of over £100 million). The central government income of the latter increased by 49 per cent, and their local government income increased by 22 per cent (NCVO, 2016). In general, the small organisations lost income from both local and central government (NVCO, 2016). Small third-sector organisations have been the worst affected by government spending cuts. NVCO’s (2016) analysis of trends in the sector’s income, expenditure and assets forecasts a £4.6bn shortfall in annual income by 2018/19. Furthermore, the government’s policy to move towards achieving economics of scale by commissioning fewer and larger contracts will have a significant effect on small sector organisations (Alcock & Kendall, 2011; The King’s Fund, 2011; Slocock, 2012). Economics of scale makes it hard for small third sector social enterprises to compete against larger third-sector organisations and private-sector organisations for contracts, due to their limited organisational infrastructure and inability to invest in new projects (Lyon & Ramsden, 2006; Maher, 2015a).